Welcome to the Hermannsburg School. This website was launched in 2002 as a dedication to the Hermannsburg School of Artists and is meant as a resource for students, enthusiasts and collectors. On the site you will find a history section, artists biography page and archives image gallery. My interest in Hermannsbug art began after I acquired a watercolour by Walter Ebatarinja, one of Namatjiras close proteges. 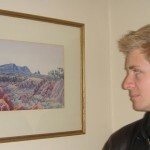 Since then I have handled works by the majority of Hermannsburg artists which form this colourful school of art. If you have any history to share about your Hermannsburg art or artists please add it to the guestbook ! Please contact me via the enquiries form below if you are interested selling Aboriginal art or artifacts. Acknowledgments: Private Collectors, Modern Australian Aboriginal Art by Rex Battarbee, Namatjira wanderer between two worlds by Joyce Batty, The Art of Albert Namatjira by C P Mountford, Albert Namatjira 1902-1959 by Andrew Mackenzie, The Heritage of Namatjira by Jane Hardy, J V S Megaw & M R Megaw, The Red Centre by Jenny Stanton, Aboriginal Art by Wally Caruana. Hermannsburg, A Vision And A Mission. Journey to Horseshoe Bent (Strehlow Research Centre), The Feathered Serpent by Roland Robinson. the town grew up dancing, Wenten Rubuntja.